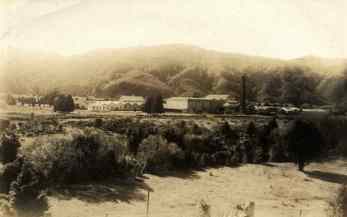 Moerewa emerged from the relocation of Taitokerau-wide Maori who by the 1940's were landless and who moved into about 30, 1 - 2 room abandoned American transit huts, at the back of the Moerewa Freezing works, providing labour for the Dairy Factory and Freezing works. Moerewa attracted Maori who started a settlement that came to be known as "Tuna Town" a ghetto that acquired a romantic aura. This disguised abject Maori poverty, the result of the crown limiting Maori development and Maori housing. Maori housing was introduced by Kawiti, Henare & Ngata in rural Waiomio in the early 1920s, however what they started was revised by the crown. Ngata's land initiatives proved to be effective but unpopular. Maori housing became restricted to urban "pepper - potted" situations. Maori were not permitted to build on their own land: rather, they were required by various means to sell or swap their land, to obtain a deposit to live somewhere else! many went to Auckland from the 1950's onwards. In the 1960's the crown reverted to allowing some semi urban maori housing settlements, such as Taumata- Makuku, these were no better off than Tunatown, in spite of the crowns involvement. It was relected in the provision of bare housing features in each house, the lack of insulation, floor coverings, floor space, quality paint, wall coverings, concreting, fencing, sewage and community facilities. Taumatamakuku was a new subdivision of some considerable size. It was a cheap settlement dumped on rocky scoria, with thin topsoil, immediately bordered on its west side by a railway line, and by State Highway One on its immediate eastern side, one couldnt imagine a more dangerous setting to raise young children! In its time Taumatamakuku was touted as a fine model of Maori housing. The freezing works was seen as motivation for town development. In truth the negative displacement of Maori off there land was a primary cause. "Urban drift" was a blame free malaise! The freezing works benefited from cheap labour in Moerewa, amongst them were landowners from whom AFFCO appropriated land. Moerewa, being situated smack dab in the middle of the North was destined for development as a service industry town. With the establishment of large corporate companies such as the Allied Farmers Freezing Company,(AFFCO) the BOI Dairy Company, the railways and associated busines's, the small rural town comprising 86 % maori (1996 census) was regarded as a booming in the heydays of the 1960s & 70s. Maori had long been groomed for employment in the semi-skilled labouring arena, so that when these industries were established Maori became the predominant workforce. Many commuted daily from outlying districts, for employment, while others uprooted and moved to Moerewa away from culture rich and familiar whanau & hapu structures of neighbouring communities to engage in a range of labouring jobs created. One community person recalled his childhood feelings.
" In my mind as a child it puzzled me why there were no maori doctors, why all the people in charge were always white people. Maori always seemed to work for other people"
While it can be argued that these were good times for maori: there was employment, money, housing & schools built to educate the children of the workers, there was also a negative other side to the picture that would become apparent further down the track. In the 1980s major economic, environmental and political changes beyond the scope of the communitys control led to the demise or radical downsizing of these industries that had once kept the town alive. The decisions being made had a major negative impact on the people of Moerewa. For many years following this period the township battled to survive. The once vibrant community was soon to be known for a raft of negative statistics - violence, crime, alcohol & drug problems, unemployment,youth problems, social problems and low levels of achievement. For many these indicators of poor health, wellbeing, and socio economic status were regarded as the norm, just the reality of Moerewa. People felt that the solutions government departments and agencies offeres were short term programmes, aimed at dealing with the presenting issues, rather than the core problem. The community began to see that much of the assistance provided over this period was creating dependency on Government initiatives. The suggested approach by some of the agencies was to declare the older generation a "lost cause" as they were deemed to difficult to deal with and unable to make changes and instead resources would just concentrate on the young people. This notion was challenged by community people, who believed the generations could not be seperated out, as each group learned from each other, and a more holistic approach was needed. One quote was "Where do you think our children learn from? ..... their parents.... the people you have just written off, you are going to perpetuate the problem, unless you deal with the whole whanau"
Motivation for change had to come from within, the community had to find solutions for their problems. A number of local people who not only wanted better for themselves and their children, but also had a passion for the potential of young people in a community caught up in a cycle of deprivation. They had a drive that would lead to the restoration of Moerewa to the vibrant town it once was. They started with organising a 3 day community festival, day 1 was to celebrate our past, day 2 was our present, and day 3 was our future. This festival was a huge success, Friday nite was a dinner and dance for our kaumatua and kuia, and a walk down memory lane, the walls were covered with memorabilia, they were waited on by local youth, who were fascinated by the stories being told. The Saturday was a all day concert with over 600 people at the height of the day. The final day was the sunday where there was a church service and afterwards, a discussion about where to from here, what did we want for our future for our children... the future is going to be as good as we made it. The group had no master plan of attack and acknowledged that they first had to get a real insight into community issues. This was done by working closely alongside the young people and their whanau and listening to their stories and ideas. "At the time we didnt know what community development was, but we figured it was something about finding out about the needs of the community, and finding or creating services or programs to meet those needs"
"We knew if we painted the town it wouldnt stop the graffitti, we d be wasting our time, the first thing we needed to change was the mindsets of our whanau"
The grassroots development enabled the community to move away from dealing with presenting issues in a superficial and adhoc manner, as had been the case in the past, and instead identify and work with the root causes of deprivation which had been identified. These were understood to be welfare dependency, low self esteem and powerlessness, core issues that did not refer to symptoms but to causes. Key factors in understanding the loss of hope and spirit within the community was understanding the history and things that had happened to our whanau over the last 50 years. One of the first things we talked about was we didnt create unemployment. "We felt the impact of decisions made about us not by us. We dont know who made the decisions, to close the dairy factory, take away the banks, downsize the freezing works, close down the rail link, cut back hospital services, we dont know who made those decisions, but it wasnt us, as long as we are controlled by people and forces outside our community we would be victims of those decisions"
"If we can begin to understand who is making those sorts of decisions, we can understand it and respond better about it, instead of just hitting out at anything"
In addition to the loss of control over their destiny , the community of Moerewa were experiencing major changes within the traditionally strong whanau/hapu structures and radical changes in whanau accountabilities. Once the community was able to take more control over issues that affected them, and were less reliant on the big companies that once ran the town, other opportunities began to emerge for Moerewa. One of the big issues was a public toilet in the town it was the catalyst for learning about working together on community projects and led to other developments and opportunities. It wasn't just a toilet... the toilet symbolised a battle won in many areas, and new understanding learnt by our community. A lot of the battle was with the District council, some of their old school attitudes were... they dont deserve one... they'll wreck it !... ok have a toilet but lock it up, and hold the key at the Trust and only let the visitors to the town use it!... We were determined to get our toilet and had many meetings with council, collected many signatures, and answered the many critics.... we got our toilet on 1999 !